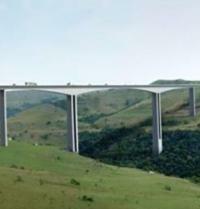 A statement has been issued by Aveng Strabag Joint Venture (ASJV) following the dismissal of a court application in relation to the termination of its contract to build the 1.1km-long Mtentu Bridge. 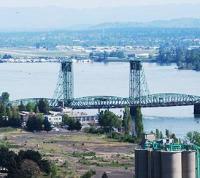 The legislature in the US state of Washington has taken a first step towards the funding of a new bridge across the Columbia River. The company that was building the bridge that collapsed last year at Florida International University is reorganising its business under Chapter 11 of the US Bankruptcy Code. Transport for London (TfL) has published details of all the money spent on the Garden Bridge project, which was cancelled in 2017. UK Export Finance (UKEF) is to provide US$62 million of support to help a British firm build 250 bridges to connect rural communities in Sri Lanka. A task force in the US state of Louisiana has recommended the use of a public-private partnership to enable rapid replacement of the Interstate 10/Calcasieu River Bridge. A charitable foundation operating in Winnipeg, Canada, has offered funding to the city council in support of two infrastructure projects. The contract for construction of the civil engineering works for the Simone-Veil bridge in Bordeaux, France, is to be re-tendered this spring, after the city municipality reached agreement with contractor Razel-Bec to partially terminate the existing contract. A technical review into a US$2.8 billion bridge project in Canada has concluded that the proposal was drawn up without full consideration of alternatives. More than 200 US bridges are set to be upgraded after receiving funding from a US$1.5bn programme to revitalise infrastructure. 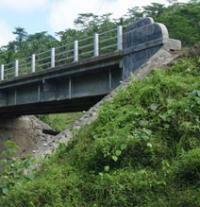 The planned Mangoky River Bridge project in Madagacar has secured a loan from the Kuwait Fund for Arab Economic Development. The tender process has started for consultancy work for a planned 25km causeway linking Bahrain and Saudi Arabia. An agreement has been signed for the development and finance of a road-rail bridge linking the Democratic Republic of Congo and the Republic of Congo. The Welsh government consulting with the construction industry before deciding whether to split a major motorway scheme into three packages, one of which would be a cable-stayed bridge. 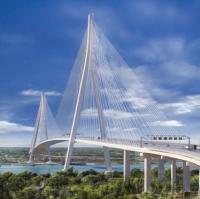 The group previously named as preferred bidder for the record-breaking bridge linking Canada and the USA has now reached financial close on the US$4.4 billion project. 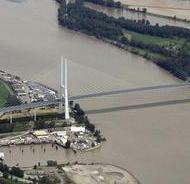 Port commissioners in the US state of Washington are calling for a new bridge over the Columbia River. The Ukraine government plans to discuss with its Moldovan counterpart a proposal for a bridge linking the two countries across the River Dniester. 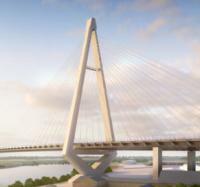 The client for the Gordie Howe International Bridge has approved Aecon’s request to rejoin the project team after withdrawing earlier this year. Timothy Creson appointed to lead North American contractor.